Madras, now called Chennai, the first city of Tamil Nadu, is comparatively a new city. The erstwhile villages of Mylapore, Triplicane, Ezhambur (Egmore), etc., all now a part of Chennai, have a recorded historical past centuries older than Chennai. Chennai is ever growing, changing and pulsating with new activities. The city of today, one of the great metropolitan cities of the world, and the fourth largest city in India, grew from the Fort that Francis Day and his superior Andrew Cogan of East India Company built on a narrow strip of no-man's land that they negotiated with the local governor of the Vijayangar Empire. The approximately 5-square kilometer sand strip that was granted has now grown into a city of about 170 sq.kms. Chennai (formerly Madras) has the Bay of Bengal bordering its east, while the state of Andhra Pradesh is on its northwest. 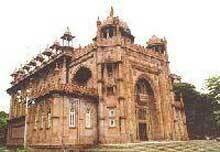 It has the famous district of Tamilnadu, Kanchipuram, on its south and the states of Kerala and Karnataka on its western side. Being situated at the tropical zone, Chennai normally has a very hot and humid climate. Winter and summer temperature does not vary much as it rains frequently through the year. The best time to visit this city is the winter season. From November to February. This ancient Siva temple is a delightful introduction to Dravidian temple sculpture and architecture. This is the country's only Wild Life Sanctuary within a city's limits. The building of the nucleus of this Fort in 1640 was the first step towards the founding of Chennai and an Empire. Once British Society in Chennai used to meet in the Pantheon. Its 18th century buildings and grounds have over the years since then been developed into the Connemara Library, one of the country's three National Libraries, the National Art Gallery, a beautiful building of Jaipur - Mughal architecture, the Government Museum with its fabulous collection of bronzes and the Museum Theatre, a quaint theatre that is another building out of the Museum Theatre, a quaint theatre that is another building out of the gaslight era. A unique bit of modern building in the city is the huge auditorium that draws its inspiration from the great temple builders of Tamil Nadu's past. This huge memorial hall to the Poet-Saint Thiruvalluvar is dominated by a towering temple car in stone. This is a special designed place near Taramani, Adyar, to serve the film industry. Several sets of artificial sceneries like forest, water falls, market place etc., are built here to serve as background for the shooting of films. Stretching two miles, from the Coovum River's mouth, south of the Fort, till the northern boundaries of the 16th century Portuguese town of San Thome, is this magnificent beach drive and promenade. Just like the other Indian places, Chennai also celebrates a number of festivals. The festivals are mainly based on the agricultural activities and according to the position of the stars and planets. Pongal, celebrated in the month of January, is the most important festival of Chennai. Being a cosmopolitan city, almost all the religious festivals are celebrated here. Chennai is renowned for its handlooms, both the exquisite Kancheepuram silk sarees and the cottons used designed sarees, shirts and domestic furnishers. The Co-optex showrooms offer a wide variety of both types of handlooms, whereas the Khadi centres are better known for their cotton varieties. The several Nalli shops, the Rasi showroom in Mylapore and other saree shops near Panagal Park and Dhun Building (Anna Salai) specialise in the finest silks. Chennai is also a major handicrafts centre; the Government's Poompuhar specialising in metal (Bronze) and stone work articles. The Victoria Technical Institute has perhaps the widest variety of South Indian handicrafts. Anna Salai offers comfortable shopping for all varieties of goods in western comfort, whereas George Town offers the same variety in a bazaar atmosphere. There are two major railway terminals in the city. Chennai Central connects the city by broad gauge to all major cities and towns of India. You'll need to go to Egmore, if you want to go to places within the state or to neighbouring Kerala. You can drive into the city from any part of the country.